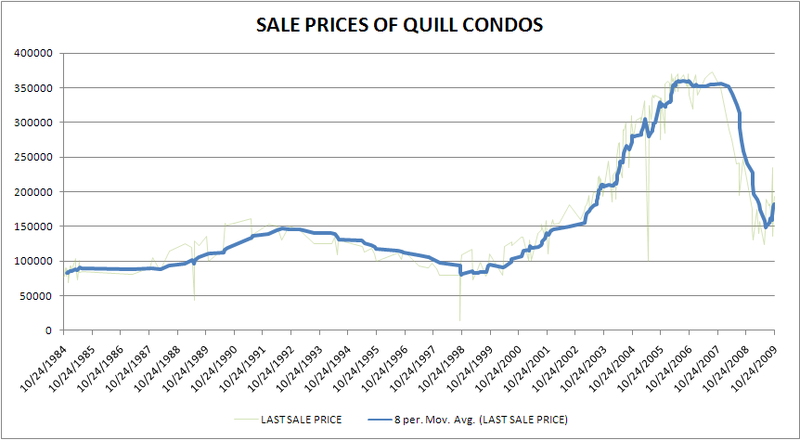 I thought it would be interesting to look at the sale prices of condos in the condo complex where we rent in Downey, CA. The graph speaks for itself. Prices in Southern California were completely out of touch with reality. Look at the bubble in the early 90’s. Prices only went up by 50% and then declined for 6 straight years. 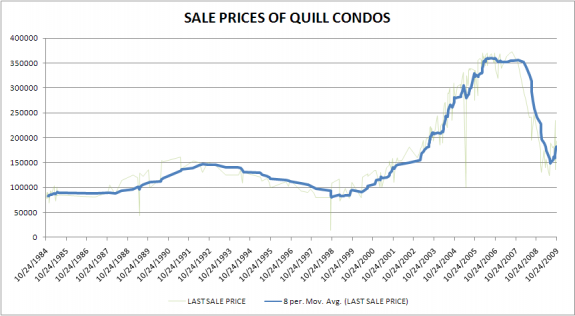 In this last bubble, prices increased nearly 350% between 2000 and 2007. Much of those gains have been wiped out in 2 years since the bubble burst. This graph is quite useful because it is comparing identical units (~300 sq. ft. max difference) in close proximity to each other. Expanding the comparison to Downey as a whole would introduce comparisons between dissimilar homes in substantially different neighborhoods. It doesn’t make much sense mixing the large sprawling homes of Northeast Downey in with the tiny houses south of the 105. Does anybody really believe prices will continue to trend upwards with high unemployment, shadow inventory twice the size of what is listed and the upcoming wave of Option ARM recasts? Good thing Congress extended the $8,000 credit, wouldn’t want housing to be affordable. Did things get as bad as I thought? Back in August of 2007 I wrote this post, Someone forgot to refill the Real Estate ATM, and predicted that we would see a continued drop in prices, foreclosures would go up and so on. What I didn’t see coming was a big drop in the stock market, sharp increase in unemployment and the massive expansion of government into the financial and mortgage markets. Things are definitely worse than I thought they would be. One of the suggestions Bernanke made was for mortgage and other financial companies to reduce the amount of the loan to provide relief to a struggling owner. “Principal reductions that restore some equity for the homeowner may be a relatively more effective means of avoiding delinquency and foreclosure,” Bernanke said. With low or negative equity in their home, a stressed borrower has less ability — because there is no home equity to tap — and less financial incentive to try to remain in the home, he said. You end up with low or negative equity two ways: you bought a house and then took a home equity loan based on the new appraised price or you were unlucky and bought an overvalued home before prices walked off the cliff. If home prices never went down low equity wouldn’t be a problem, but they are and they’re going down hard. As prices go down people start to owe more than the house is actually worth, still not a problem. The problem comes from not being able to afford the monthly payments on the home which means the borrower should have never gotten the loan in the first place! So why does Bernanke want people to have equity in their homes? So they can tap it like an ATM and spend it on fancy cars and boats, pumping much needed money into the economy. But that money isn’t real and is being conjured from the perceived value of a big wooden box we call a house. Haven’t we learned anything from the past 4 years? Lenders have started returning to their senses and are requiring down payments and income documentation. Borrowers are realizing their overpriced McMansions aren’t worth holding onto and are walking away. Prices are falling, construction is slowing and inventories are going up. So where will things end up? Right where the market determines they should be. I think we’ll see the return of affordable single family homes in late 2009-2010. I don’t really consider myself a pessimist, but I do pride myself on looking at the facts and coming to my own conclusions. To me the outlook of the housing market and the economy as a whole have some troubling times ahead. Somebody finally realized you can’t loan hundreds of thousands of dollars to people who couldn’t afford the payment at normal interest rates. Don’t have a down payment? Just take out another loan for it. Need some easy cash? Turn your house into an ATM and cash out your equity. Prices went up so quickly because there were lots of people in the market with easy access to credit through risky loans. Would you give half a million dollars to someone without any income documentation? Equity is determined by the appraised value of your home, the only problem is that equity isn’t realized until you actually sell your home. That’s all fine and dandy in a world were home prices never go down, but without congruent increases in income those prices can’t be sustained. Fast forward a little bit: lenders start tightening up loose standards, foreclosures go up, supply goes up, demand goes down and prices start to follow. Cashing out your equity combined with decreasing prices puts you in the predicament that the outstanding loans on your home could be more than the market price. Hello negative equity. Now what happens when you can’t make the monthly payment on a house that is worth less than you owe? You try and sell or end up foreclosing which has the double wammy effect of ruining an individual’s finances and if it starts happening enough, effects the lenders, banks, and economy. Where do I think we are? I think we’ve just seen the tip of the iceberg, but the iceberg isn’t enough to sink the economy. The people that weren’t suppose to get loans in the first place will default on their loans, there will be a surplus in inventory and then prices will drop and stagnate for a while until wages can catch up. The bigger issue at hand though is our nation’s infatuation with spending money we don’t have. If things keep going the way they are we’ll probably be in a world of hurt in a few decades. Thank you reading my somewhat organized and logical rant.